Fiction is the exploration of self in self’s many forms. When we read we slide into another’s skin, shod our feet with the preparation of another soul’s gospel. As writers, we create this surreal intimate effect, in part, by bending time. Beginner writers will examine the components of a story, align them in linear fashion, then write the story based on plot points: this happens, then this, and then this, until, finally, that happens. All novels include a linear plot, action that pushes the story forward. It’s the more experienced writer who can take the elements of plot past, present, and future, shuffle them like a magic deck of cards, arrange them differently, and present a coherent story made richer through the bending of time. There’s a taboo word in fiction writing circles: Backstory. It’s naughty to write backstory. Right? How did the past, those elements of a character’s story which take place before the story happens become such a bugaboo? Somewhere along the way, all personal history was lumped together into one mushy pot of backstory goo. Writers too often include story-irrelevant details in their manuscripts. Readers go cross-eyed soaking up all the details only to discover that, in the end, very few mattered to the story. There are, however, story-relevant details that not only should be included in the present story, but need to be highlighted and given their own scenes. There are events that happen future to the currently occurring events within the linear story that need to be brought into the present. A fiction writer is a time-travel tour guide. A storyteller, with eyes forward and in the back of her head, leads with a flashlight in and through time, then, near the end of the story, she flips the switch, bathing the reader with the light of understanding of how the past, present, and future occur all at once inside the story of you. Because fiction is about being human, it is the collusion of past, present, and future. The story-imprint of the way we think, process, remember, and live. There are facets of your past that are as present as if they were occurring right this moment. 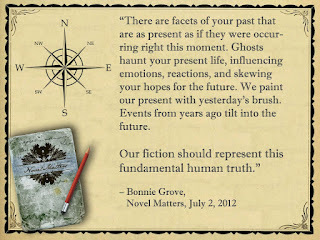 Ghosts haunt your present life, influencing emotions, reactions, and skewing your hopes for the future. We paint our present with yesterday’s brush. Events from years ago tilt into the future. 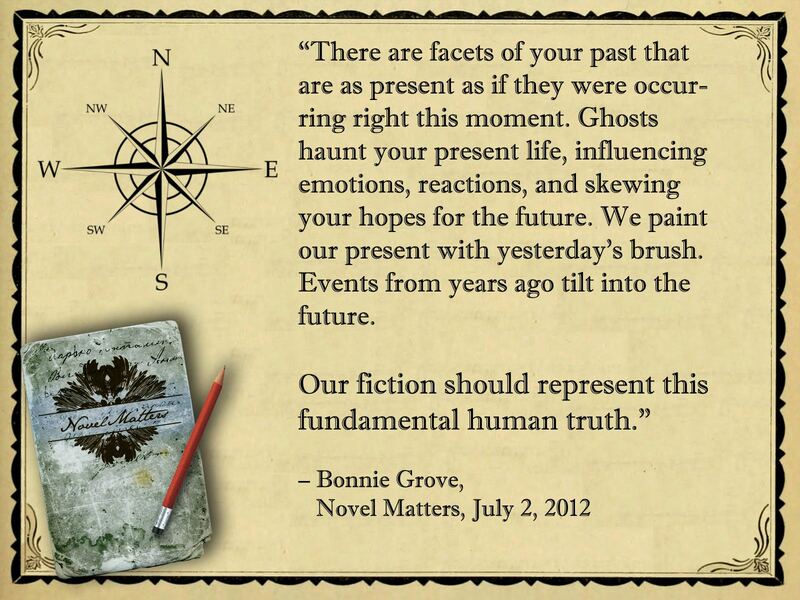 Our fiction should represent this fundamental human truth. Write oodles of backstory as you please. Then, wade up to your armpits through the words looking for the tiny handful of story-relevant bits, the images, events, and/or voices from the past that haunt your character. This is the ghost. You will know it when you find it because it is small, fleeting, and painful to the touch. Write the ghost. Craft a scene about the ghost that reads like a short story. If you’re not deeply moved by the scene, re-write it. Repeat as necessary. Take the ghost for a walk. Nudge it into the plot, push it deep toward the end of the story. Watch what it does. Document its shimmer and gloss, how it dims, or grows menacing. Write a scene about the future of this ghost. If you’re not deeply moved by what you’ve written, re-write. Delete half of each scene you’ve written. At least half. Likely more. Re-write the ghost. Yes, again. Now you’re getting to the heart of it. Now you are beginning to see that single, defining moment in time that haunts your character. You likely need a tissue or two. Blow your nose. Brace yourself it’s going to get painful. Live the moment. Slip into the skin of your character, shod your feet with preparation of this soul’s gospel. Expose yourself to the potentially fatal harm. Invite the haunting. Then, you will understand all you need to about the way time bends inside of us. Yeah! Bonnie this is great. I'm about half-way through this process at the moment. This post feels like you've crawled into my brain and started labeling things that I've been doing intuitively, so I'll be able to repeat the process at a later date and won't be floundering around wondering where to go next. Now, would you like to sort out my pantry? Ooo! I just realized something that haunts the character in my current novel. Yes. While reading this. Hey, thanks, Bonnie! Gotta go write it down. Bonnie, it's so spooky when you look over my shoulder like this. Thanks for putting into words what I've been consumed with for the past couple weeks. A ghost. Write the ghost and re-write the ghost. I've got work to do. Emma: Great coffee stain analogy. The vast majority of backstory is useful for the writer, not the reader. The trick is to let the reader see the coffee stain, and then, because of the depth of character present, decide for herself why the stain is there, how it got there, what it means. Susie: Love those flashbulb moments. Just take care not to be fooled by them. Tip of the brain ideas always need careful exploration and reframing in order to avoid feeling cliche, or preachy. Hunt down the indirect light shining on your insight. The sideways slant. Patti: I love looking over your shoulder. I always learn something. Great post! There are some deeper truths here beyond writing - things that speak to us as humans in relationship. This would be a great exercise in understanding yourself as well. You should tell us a bit about how you bent time in Time and Time Again. Bonnie: I'd had half of the haunting written...it just needed something more. Your post made my brain flash. Thanks for that! If your words in this post were blankets or grassy fields, I would want to roll around in them. Wonderful post. Ah, yes, that's it; backstory is mainly for the writer. Now, how to give only tempting morsels of it to the reader? Cherry: It's the life long lesson of learning absolute abandon inside the strict confines of story. One question I'm always asking myself (and often answering incorrectly) is: Where does this belong in this story? Usually the answer is: it doesn't.